Abner Rogers is one of the best and most famous women's soccer coaches in the world today. 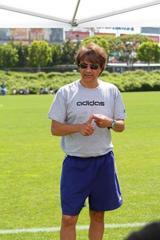 An internationally and nationally respected coach with extensive experience and a history of success in women’s soccer. Rogers 2010 induction into the USASA Hall of Fame symbolizes his significant contribution towards the development and advancement of adult amateur soccer. A native of London, Rogers is a graduate of City and East London College and obtained his Football Association Full Badge in Lillishall England in 1984. In 2001, Rogers founded the Laguna Hills Soccer Club Eclipse where he was President and Technical Director. An organization which has been ranked as a top 20 girls club in the nation for five consecutive years. Rogers is attributed with creating the program philosophy, curriculum and guidelines, including coaches education, which has boosted the club into national distinction and landed three National Championships (2002, 2005 and 2010). Rogers was awarded the California Youth Soccer Association Coach of the Year in 1995 and 2005 for his commitment at the youth level. In addition, Rogers served from 2004-2008 as Head Coach of the USASA National Team where he coached international games against Australia, Mexico and several U20 National teams. He was also the Head Coach of the Region IV Women’s Olympic Development Program (ODP) team which won multiple gold medals at the US Soccer Festival in 1996, 1998, 2000, and 2002. Overall, Rogers has mentored and developed 13 players to Professional ranks, 31 to Regional teams, and 22 to National teams. Five of his players have played in World Cup competition. With accolades and accomplishments such as Rogers, it is understandable that in 2009 he was named as Head Coach of the LA Sol in the Women’s Professional Soccer (WPS) League. The team won the league championship and were WPS finalists. Rogers was named the 2009 WPS Coach of the Year, as well as coach of the All-Star team. In 2011 Rogers assembled another talented team in the OC Waves in the WPSL. The team won the National Championship in it's first year and Rogers was named WPSL 2011 Coach of the Year. Abner is now that Director of Coaching and President of Strikers FC ECNL club in Irvine, Orange County. Current President and Technical Director. Laguna Hills Soccer Club Eclipse An organization which has been ranked as a top 20 girls club in the nation for five consecutive years. Founded the Laguna Hills Soccer Club Eclipse. Created the program philosophy, curriculum and guidelines, including coaches education, which has boosted the club into national distinction and landed three National Championships (2002, 2005 and 2010). Nationally respected coach with extensive experience and a history of success in women’s soccer. Induction into the USASA Hall of Fame 2010. Awarded the California Youth Soccer Association Coach of the Year in 1995 and 2005 for his commitment at the youth level. Head Coach of USASA National Team. Coached international games against Australia, Mexico and several U20 National teams. Head Coach of the Region IV Women’s Olympic Development Program (ODP) team which won multiple gold medals at the US Soccer Festival in 1996, 1998, 2000, and 2002. Mentored and developed 11 players to play to the professional ranks, 27 to Regional teams and 18 to National teams. Five of his players have played in World Cup competition.